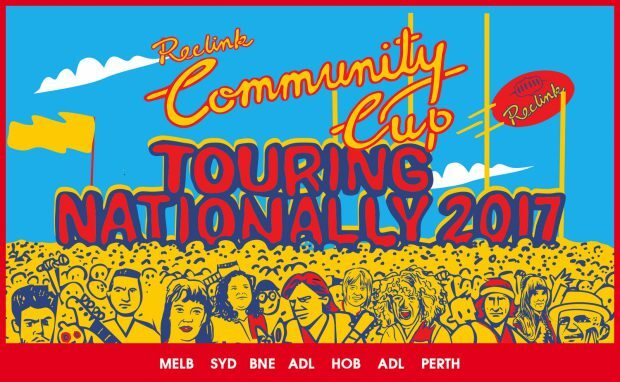 The ever-popular Reclink Community Cup is returning to Perth in 2017 taking place at Fremantle Oval on Sunday September 3. The national event draws on support from the radio, sports, music and arts sectors in a fun but fierce AFL match to raise money for disadvantaged communities across Australia. This year’s tour takes inspiration from legendary Queensland act the Go-Between’s track Streets Of Your Town, encouraging each of the six participating capital cities to celebrate the occasion in their own unique way. The event has grown from humble beginnings in 1993 and now raises more than $100,000 each year for Reclink Australia. Last year saw the Bandgropers take out the event for the second year running leaving the Newshounds desperate for redemption in 2017.